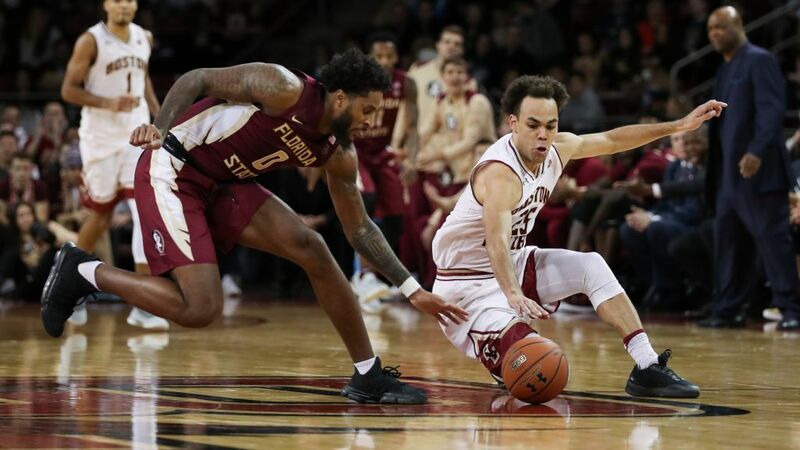 BOSTON (AP) — Ky Bowman scored 19 points and grabbed 13 rebounds, Jerome Robinson also had 19 points and Boston College beat Florida State 81-75 on Monday night. Nik Popovic and Jordan Chatman each added 14 points and Steffon Mitchell had 13 with nine boards for the Eagles (13-6, 3-3 Atlantic Coast Conference). Terance Mann scored 21 points, CJ Walker 19 and Braian Angola 17 for Florida State (13-5, 2-4). The Seminoles lost for the third time in four games. They had won their last six meetings against BC. The Eagles led by 16 at halftime and pushed it to 21 early in the second half. Switching to zone midway into the opening half, the Eagles’ defense flustered the Seminoles, causing rushed shots from the outside and many contested misses in the lane. Chatman nailed consecutive 3s just over a minute apart, capping an Eagles’ 12-0 run late in the half that carried them to a 41-25 edge at intermission. BC then scored the first five points of the second half — with Bowman hitting a 3 from the left wing — and opened its largest lead of the game. The Eagles maintained a double-digit lead until the final five minutes when it was sliced to seven. The Seminoles had it down to five in the closing minute, but Robinson and Bowman each hit free throws to seal it. Florida State: The Seminoles fell out of the Top 25 this week after being in there the previous five, but the bigger problem may be the lack of confidence they could be facing after another loss. Last week, they had their 28-game home winning streak snapped by Louisville on Wednesday before edging Syracuse in double-overtime Saturday. Boston College: The Eagles’ growth continues in the ACC. They have surpassed the total number of league wins they had combined the previous two seasons. The game featured two of the ACC’s top three teams in shots made from 3-point range. Florida State (9.3) came in leading the conference and BC (8.6) was third. The Eagles won on this night, though, going 9 for 23; while the Seminoles were 5 of 26 after missing eight of nine in the first half. Florida State guard PJ Savoy missed the game with a knee injury, but leading scorer Mann returned after being out the previous one with a concussion. The Seminoles shot just 25.6 percent (10 of 39) in the opening 20 minutes. Florida State: At Virginia Tech on Saturday. Boston College: Opens a two-game road trip Sunday at Louisville.